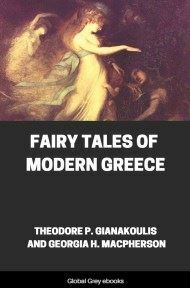 This is a collection of stories about Greek fairies. Similar to the northern fairies, they are not adverse to interacting with mortals. However, there is always some proviso, such as the fairy bride who is forbidden to speak, and drives her husband mad (The Fairy Mother). The tragedy can also turn the other way, such as the fairy maiden exiled from the fairy palace by one kiss from a mortal (The Fairy Comb). 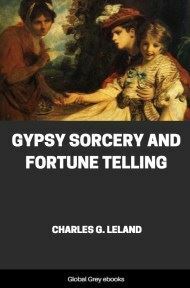 Chapters include: The Fairy-Hunter; Fairy Gardens; The Fairy Wife; Fairies Of The Waterfall; The Fairy Comb; A Fairy Wedding; The Fairy Ring; The Fairies' Theft; The Haunted Ship; The Wonder Of Skoupa; The First Of May; and, The Fairy Mother. TO the question, "Does any fragment of ancient Greek mythology survive?" the answer is, "Yes, the nymphs." For among the hills and across the fields and streams of Greece, where the gods were born and dwelt, fairies now dance and play and radiate a subtle charm. Fairies are none other than the modern forms of the dryads, oreads, naiads, nerejds, fates, furies, graces and muses of the ancient myths. They are the nymphs that sang and played with Pan and Hermes, Apollo and the satyrs, but now they play and dance and sing with common shepherds, fishermen and hunters. Their very name is as old as Pontus, their father, and Doris, their mother. Νηρηΐδα or Νεράϊδα and Νύμφη, vernacular Νύφη, have the same meaning, which we may translate "fairy" or "nymph." Fairies are the virgin divinities of the earth. They know no heaven, for they take the place of the lower, earth-dwelling gods of the ancient mythology. They were never born; they never grow old; yet they are not immortal. Their beauty is everlasting and their dance eternal. They were created out of the earth and always live upon it, the anthropomorphic spirits of hills, streams, trees and ocean. The Greek's conception of fairies springs from his worship of nature, to which he is bound by his constant love of beauty. To his mind they are beautiful maidens, endowed with mysterious power, who inhabit palaces in the clouds, in caves on remote mountain peaks, along wild, rocky shores, or at the bottom of the sea. At noon on sunlit days and moonlit nights they visit the haunts of mortals, often choosing a tall pine tree, a cave or a spring. Sometimes they come singing, playing violins or flutes, or gently beating drums; sometimes they steal silently over hills and fields, seeking beautiful children or youths or maidens to carry away to their palaces for purposes of pleasure. The fairy world is higher than that of mortals. Its creatures are not subject to the same laws of nature as are binding upon us. Nevertheless, they are not goddesses and their power is not unlimited. They can be frightened and driven away by the firing of a gun. They dare not touch the mortal who wears a felahtare, bag of incense, such as many Greeks have suspended about their necks. The cross, a sign of the cross, and prayer, are protections against them. If a mortal seizes a fairy's handkerchief or veil, a strand of hair or a bit of clothing, the fairy becomes a helpless mortal woman, bound to serve the human being who thus captured her. If the fairy article returns to the possession of its rightful owner, the woman regains her fairy attributes and power, but should the article be burned to ashes, communication between her and the fairy world ceases and she is doomed to die a mortal's death. Music, laughter and song, play, dancing and love are associated with fairies, but at times these creatures can be cunning and cruel and, when thwarted, revengeful. Occasionally, as in the case of the water fairies, they offer gifts to their prospective captives. By accepting these gifts, mortals place themselves under the fairies’ dominion, from which escape is possible only by burning the gifts. Fairies have destroyed the happiness or wrecked the life of many a youth who, having seen them, cannot put the memory of them from his mind, or who, having possessed one of them, has lost her forever. The springs from which fairies drink are called μαγεμένες, bewitched. The mortal who drinks from such a spring becomes μαγεμὲνος, fairy-possessed, and, forgetting home and family, wanders aimlessly like one mad. The mediator between the fairy and the mortal worlds is the sorcerer or the sorceress. The sorceress is the more common. She is usually an old woman with a practical knowledge of healing and much supernatural lore. She not only cures physical ills, but she ministers also to the troubled mind. By conjuring, murmuring mystic words, and applying magic herbs, she can release a μαγεμὲνον, bewitched mortal, from evil spirits. The sight of an old sorceress with her bag of magics, wandering over lonely hills in search of herbs, is familiar to every villager in Greece. These awesome women live a hermit's life, seeking the unfrequented ways, speaking little, mingling with their fellow beings only when summoned to aid. 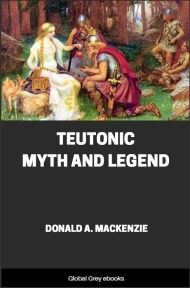 The relation of Christianity to this last remnant of mythology is an interesting field of study. 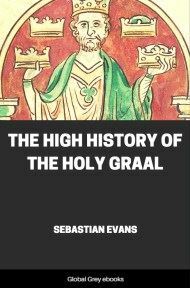 As a sacred Christian symbol serves to frustrate the power of a present-day fairy, so has Christianity, adopted as the state religion, dethroned and driven out the ancient gods. In the revolution, the new religion borrowed much from the old worship in church customs and seasonal festivities. It can be truly said that the Greeks are scarcely yet Christians, for in their hearts linger fragments of pagan nature worship and superstitious awe of the anthropomorphic creatures that are a part of nature. 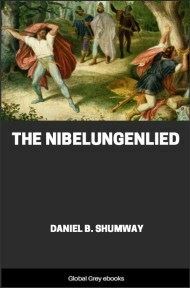 One can see most clearly the mingling of Christianity and paganism in the felahtare. Grandmother Adamis’ bag, described in "The Fairies’ Theft," page 89, "contained incense from Mount Levanos, a bit of candle that had burned on Easter before the portrait of the Virgin, a leaf from a hundred-petaled rose and an amethyst stone. 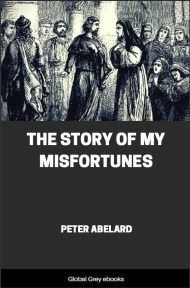 The bag had been hung about her neck by her godfather on the day of her baptism, to protect her from all evil." My personal experience with fairies, which is recounted in "The Fairy-Hunter," began and ended in that one venture. But I was to be associated with many who claimed first-hand knowledge of fairies and with many more whose relatives or acquaintances or ancestors said they had been given glimpses of the fairy world or contact with its inhabitants. In "The Fairies’ Theft" is found the story that my Grandmother Adamis related as her own. It was she who told me "The Fairy Ring," "A Fairy Wedding," and "The Fairy Wife." She had heard the latter from the lips of Demetros’ mother who went about half mad through Loutro, telling the sad tale after her son's disappearance. Uncle Kostas, "uncle" to the whole village, loved nothing better than to narrate, to anyone who would listen, the story we give in "Fairy Gardens."